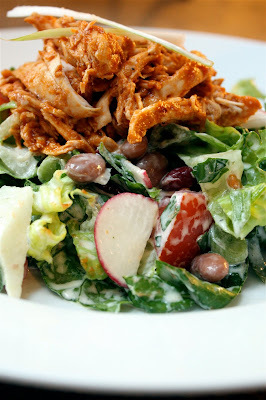 Barbecue chicken salads are fairly common on many restaurant menus. But it wasn't until I had it at a friend's home several years ago that the thought finally hit me...why have I never made this? It's a super easy, quick-to-table, satisfying salad that you can load with just about anything you like. The only standards being the shredded chicken slathered with BBQ sauce and, of course, the crunchy greens drizzled with Ranch dressing. The whole BBQ sauce-Ranch dressing combination is what makes this salad so appealing. It's not really much of a recipe. It's more of a chop, drop, and dress meal that can be on the table in 15 or 20 minutes, depending on which direction you go with your ingredients. If you roast or boil your chicken, that will add another 30 minutes or so. If pressed for time, I grab a roasted chicken at the market and shred the breast meat for this dish and hold the rest of it for another meal. And you can certainly prep your own BBQ sauce, but bottled works great. I happened to used Annie's Naturals Organic BBQ sauce and really liked it (though I've tried many different brands over the years and all have tasted great). The same goes with the Ranch dressing...buy bottled, whisk up a quick buttermilk variety with a packaged mix (I used a Whole Foods Ranch mix that calls for fresh buttermilk and mayonnaise), or create your own. 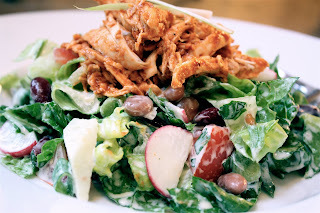 In addition to the "standards" of shredded BBQ chicken and Ranch dressing, I recommend using romaine lettuce. It's a good sturdy green that keeps its crunch and holds up well to the boldness of the chicken. Then you just add your favorite goodies. I like ones that have good flavor and some crunch...like radish, celery, green onions, cilantro, and jicama. I also always add a cheese...usually diced or cubed, rather than shredded. This time out I diced up some pepper jack. Diced tomato tastes great...and I always add some variety of bean. This time I used a can of organic salad beans which is just a combination of pinto, garbanzo and kidney beans. However you plate it up, this is a refreshing, flavorful, satisfying salad that makes a great, quick weeknight meal. 1. Mix barbecue sauce into shredded chicken, until you get a nice coating without excess. Cover with plastic wrap and place in fridge. 2. 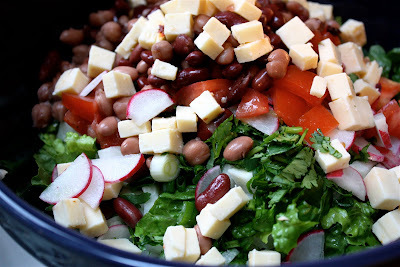 In a large bowl, combine romaine and next 7 ingredients, through beans. 3. Drizzle lightly with Ranch dressing. To serve, mound salad in center of plate and top with BBQ chicken. Season with salt and pepper, to taste.